Last week I was working on the foodie section for a friend’s hilarious and brainy new website, PhilomobileInNaples.com, and I had the great pleasure of researching and writing about the origins of pasta and the pasta machine, much of which significantly happened in Naples. Caffe sospeso literally means “coffee in suspense” and in old timey Neapolitan society it was a custom to order not one but two coffees at a time, one for you and one for someone else less fortunate. The order would be logged in the cafe’s book until someone else came in and inquired, at which point they would be graciously served. Anyway, to read more pasta trivia (and mythology), check out La Storia di Pasta. So, what do you do after spending a whole day reading about Neapolitan pasta? Make fresh pasta! How could I not? The egg pasta dough recipe is super easy and straight out of Mark Bittman’s How to Cook Everything Vegetarian cookbook,* and he also has a vegan version in there but I wanted the full “Crack-The-Eggs-Into-The-Flour-And-Mix-With-Your-Hands” Experience. 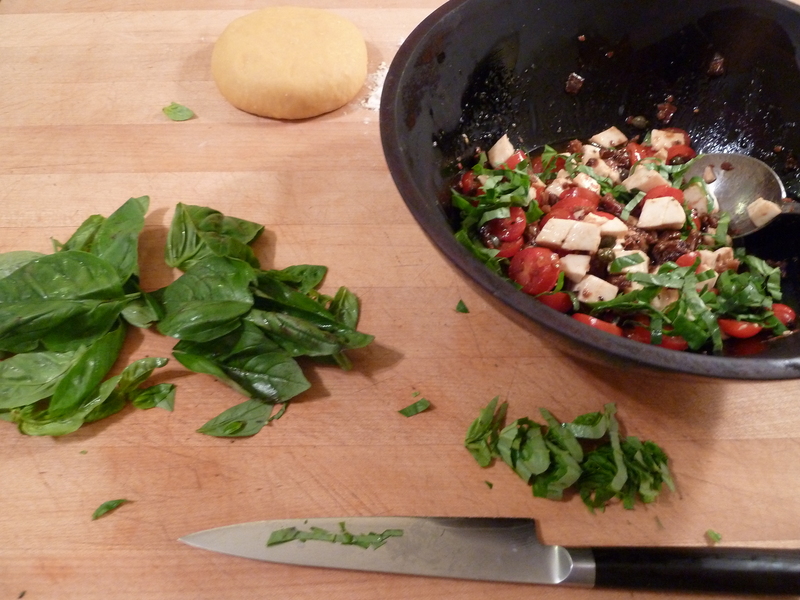 (And besides, I was planning to top it with a very un-vegan fresh mozzarella, basil and tomatoes). So this is it. Combine 1 1/2 cups flour and salt on a counter or large board. Make a well in the middle. Into this well, beak the eggs and yolks. 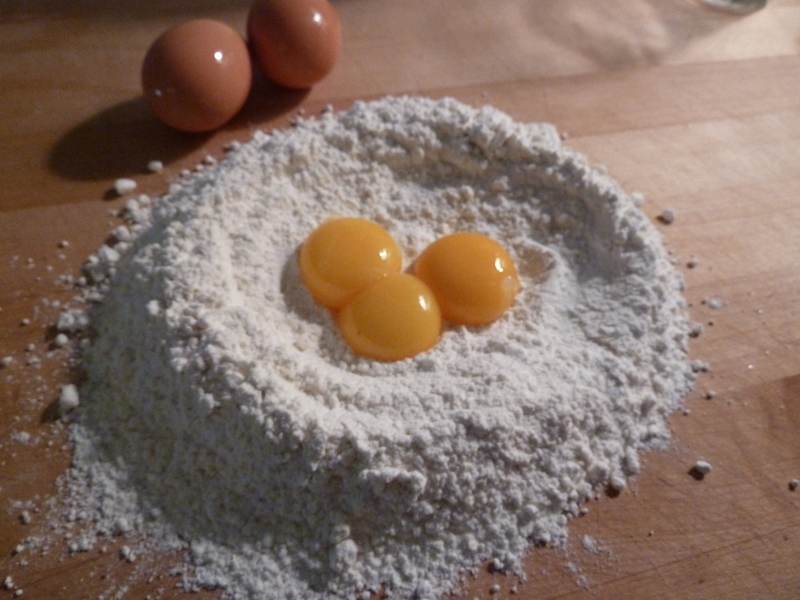 Beat the eggs with a fork, slowly and gradually incorporating a little of the flour at a time. When it becomes too hard to stir with a fork, use your hands. When all the flour has been mixed in, knead the dough, pushing it against the board and folding it repeatedly until it is not at all sticky and quite stiff. Sprinkle the dough with a little of the reserved flour and cover with plastic or a cloth: let it rest for about 30 minutes. 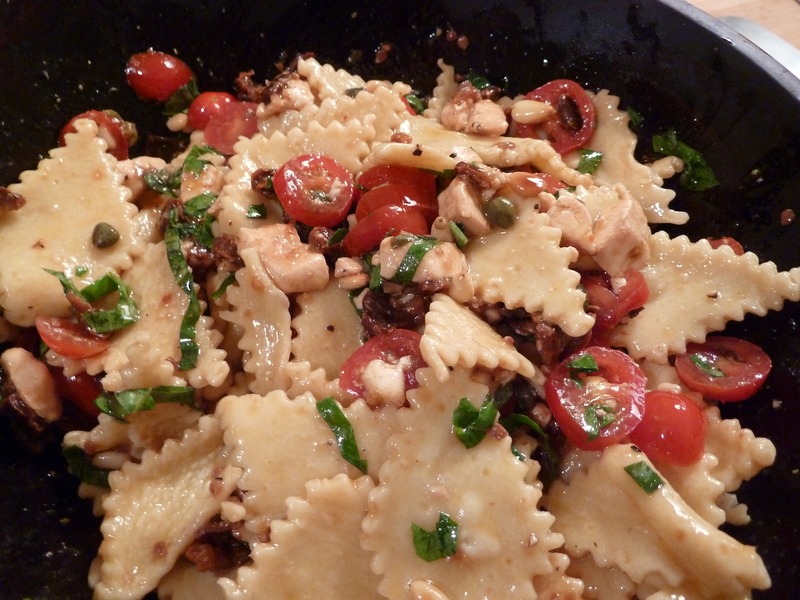 In a medium sized serving bowl, combine all ingredients except salt and pine nuts, and let marinate together at room temperature while the pasta dough is resting and cooking. Roll the dough out on a lightly floured board as thinly and evenly as possible and cut into any shape you like. You can see that I went to town with the ravioli roller. .. Boil in salted water for just 2 – 3 minutes until tender but al dente. 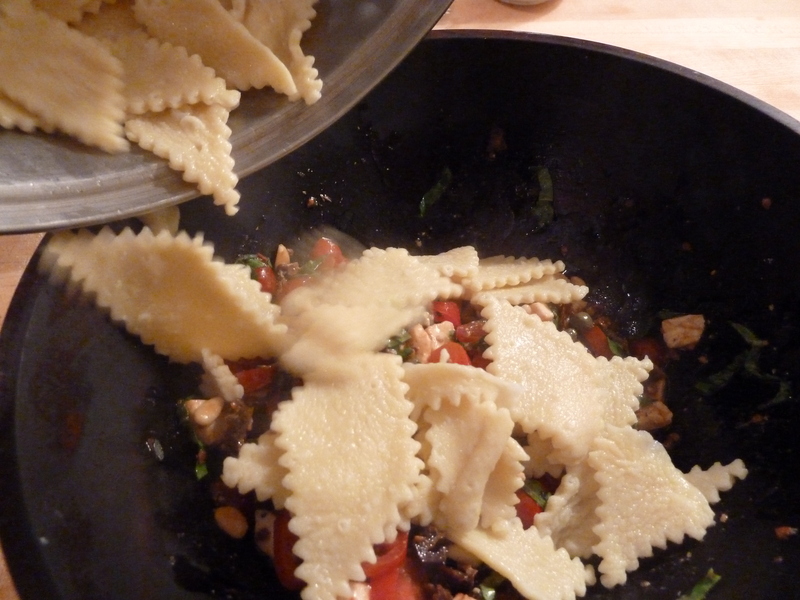 Drain and toss with Margherita mixture, and toasted pine nuts, adding salt to taste and drizzling with a bit more olive oil as needed. Serve immediately, while the cheese is still cool and the pasta is hot. Enjoy! *Mark Bittman’s How to Cook Everything Vegetarian has become my all purpose cookbook bible (really! It’s huge but I shlepped it all the way to Bali, and to Costa Rica before that. And you know what? It was the one cookbook that Tracy Morrisette – the chef I was working with in Costa Rica – had also brought with her from the States! Says something, I think). I rarely use recipes except for reference, but when you need a quick and reliable basic, like fresh pasta dough, or need to to know how many beans to soak to feed 40 people, this is the book to turn to.